Beautiful views of the NORWAY leaving Bergen. The late Captain Geir Lokoen was Master and Frank Julliussen was Staff Captain. I was on board it was a great cruise and a great sail away from Bergen. Yes, that's right Skyward. The Askøy bridge was full of people who wanted to see. Remember the ship's whistle quite a bit as well when she passed under the bridge. Believe and remember that Captain Lokøen lived at Askøy too? Yes, I remember steaming under that bridge and seeing all the people on it. It was hard to believe so many people came out to see the NORWAY sail. Captain Lokoen was dear friend. Still looking for a lot more information, confirmations and images which I can share on those pages. Please do not hesitate to make contact if you have anything to share. Need some help with the SS Norway Master List in particular. One of my favorite images of NORWAY sometime in 1984 at Miami. 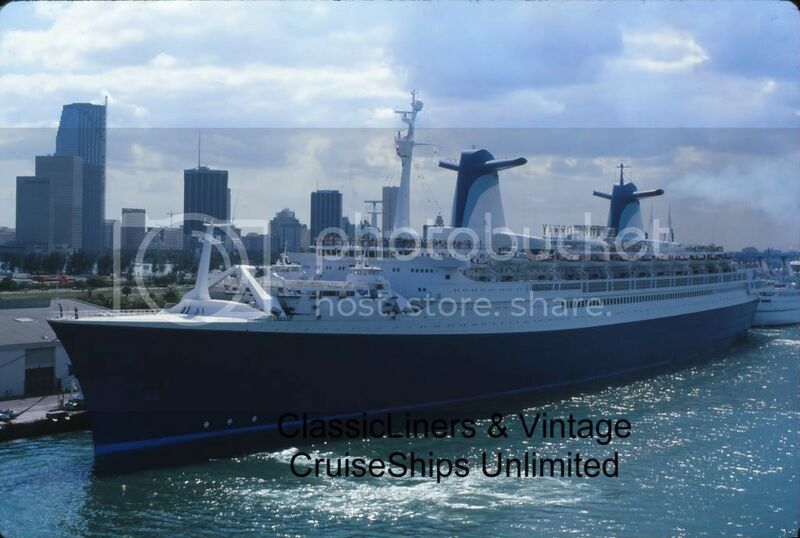 This appears on my site(www.classicliners.net) and was taken by Ernest Arroyo. That is the very best angle she could be photographed at.... this enhances her looks so wonderfully! New images of her tenders have been added, and Masters List is also being updated (need confirmations on many issues there). I agree, just so majestic and proud! Re: S|S France and S|S Norway : 1.000 (or more) fun facts. Maybe you know already this site but ,if not, you can link with www.frenchlines.com/ ,where you can find a lot about FRANCE/NORWAY.Site partially in english. Last edited by yvneac; March 22nd, 2012, 23:10. 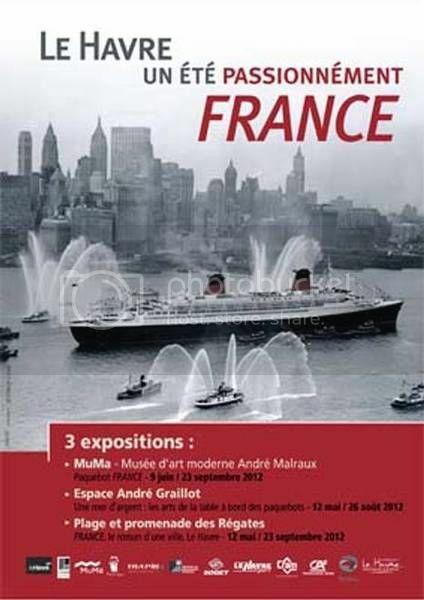 Three exhibitions next summer about SS FRANCE in Le Havre 9 june to 23 septembre. Read more on www.lehavretourisme.com .Pages in english and german. I know eroller, he's on another forum I go to. I didn't know that there were sliding glass doors that went out to the Great Outdoors Restaurant in the early 1980s....when I sailed my first time on the ship, it had the NY style revolving doors on both sides. Sunny day in Bergen 2012 with the SS Norway 6 mtr postal flag waving ! Last edited by thenorway; August 16th, 2012, 11:50. Great to see that Flag flying high again. Ahhhh.... love the flag, I have one myself.... the scenery has changed, and the ship is gone, but the flag still looks great!